On March 5th, the Duke and Duchess of Sussex joined the Duke and Duchess of Cambridge, the Queen, the Duchess of Cornwall and other members of the royal family to celebrate the 50th anniversary of Prince Charles’ Investiture as the Prince of Wales at Buckingham Palace! This is the first time the fab four has been seen together at an event since Christmas day when they all walked to church together. For this daytime event, Meghan chose a beautiful brocade shift dress (designer was never determined!) featuring cream, gold, pink and silver, and topped it with a repeat Amanda Wakely coat we’ve now seen her in three or four times. She accessorized with peachy pink pointed toe pumps by Paul Andrew and a satin clutch by Wilbur & Gussie. 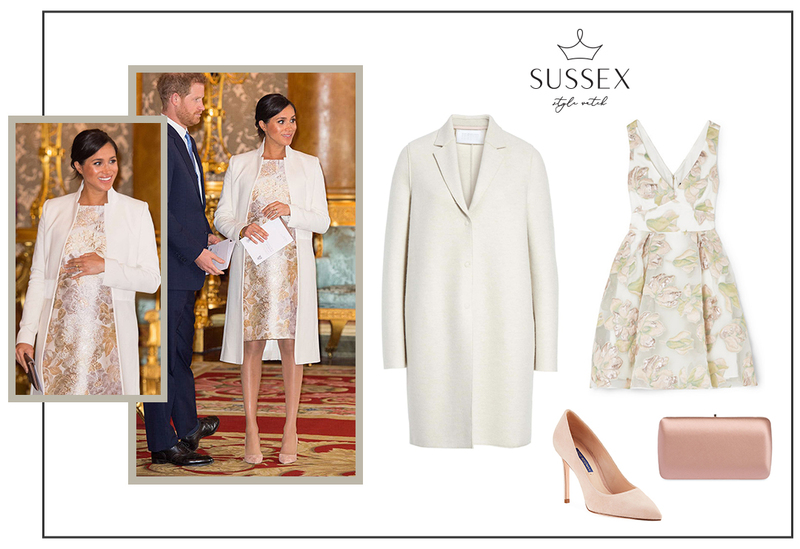 I love it when Meghan wears soft neutrals like this – she looks so amazing and sophisticated in these types of creamy colors! This is totally a look you could recreate for the upcoming Easter holiday or a springtime church look this season! So fab. Shop Meghan’s chic look below at a variety of price points!